You become an employee of Reliasys by signing an employment contract with a view to take assignments with the agency/client. Reliasys enters into a business to business contract with your recruitment agency or the end client you will be working for. You will start to carry out the contract (services agreed). The Client (who you will be on assignment with) signs the Agency timesheet, which will confirm to them the hours/days that you have worked. You will send the signed time sheet to the Agency and also complete a timesheet for Reliasys along with any chargeable expense claim. 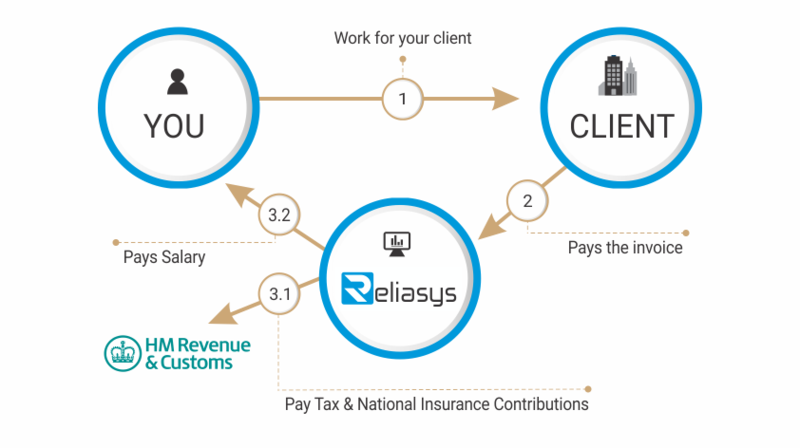 Reliasys will then raise an invoice and the agency/client will pay us the contractual rate. Reliasys will then process the payment and any chargeable expenses (if eligible) and deduct the necessary Tax and NI contributions after deducting agreed margin. You are paid, subject to PAYE and employee’s NIC and you receive your payslip. Working with Reliasys means you will not be affected by IR35 and it does not apply to you as we operate PAYE on all your payments. Not reduce the contractor’s taxable employment income. Reimbursed out of a separately identified expense allowance. With further introduction of Optional Remuneration Arrangements (opra) on 6th April 2017, a contractor cannot give up income in exchange of benefits, meaning any expense claim that reduces the contractors taxable income will be caught under the changes and will be disallowed by HMRC. The only exception to this is mileage where the contractor is working multi-site or expenses reimbursed by the agency in addition to the normal pay. For claiming any expense, we will require a completed expense claim form and it should pass the wholly, exclusively and necessarily test. Reliasys is a fast growing umbrella company serving contractors mainly in the IT, Medical and Healthcare profession. The solution has been designed keeping in mind the needs of the modern contractor. It is the most hassle free solution for contractors starting out on their contracting journey or want a simple way to get paid. Reliasys© . All rights reserved.